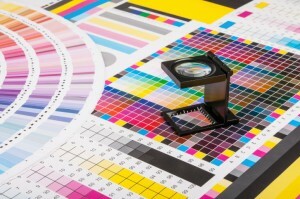 Good color management is key to producing high quality products. Good color management tools can reproduce a range of colors across a range of devices using a four color combination. These devices include scanners, digital cameras, monitors, printers, offset presses, and corresponding media. The idea may seem simple in theory, but it can prove to be difficult in practice. There are a few best practices you can follow that can help you to attain that perfect color management across all your devices. One thing that can throw off a printing job is to have files that are all saved in different printing formats. Make sure that your files are all saved in a common file standard format. This can include SWOP (Specifications Web Offset Printing), GRACOL (General Requirements for Applications in Commercial Offset Lithography), and PDF/X, a version of PDF that is designed specifically for prepress data interchange. You should also make sure that you’re following standard operating procedures (SOPs) for color management. According to the IPA, an association of graphic solutions providers, only 33% of publishing companies follow SOPs for color management. SOPs are necessary to ensure that everything produced has a consistent color. When establishing your company’s SOPs, be sure to standardize the printing preferences across all your devices. This will ensure that all jobs are printed evenly. The timing of the RGB to CMYK conversion process is an important part of color management. Once it is converted, the piece is bound to a particular type of production method. Early binding allows you to work within your set of reproducible colors to produce consistent results. Late binding provides the benefit of flexibility if a job needs to be changed last minute or has to be run on multiple output devices. No matter what kind of binding you choose, it’s important to stick to it for consistency. Finally, one of the most important ways to ensure quality color management is to make sure that all employees are properly trained. It’s a good idea to invest in new software and hardware for color management if you haven’t already. Make sure that all monitors and output devices are properly calibrated and that you have tested your new workflows. From there, you can train your employees on setting SOPs and standardizing all hardware and software. Also note: it’s important to stay abreast of the most current advances in color management technology! You can order equipment and services from Atlantic Graphic Systems and check our blog for more news and updates on the printing industry! This entry was posted on Monday, January 18th, 2016	at 8:14 pm	and is filed under industry practices	. You can follow any responses to this entry through the RSS 2.0	feed. Both comments and pings are currently closed.